There's never a dull moment with a pool dining table at the heart of your home. Pool dining tables offer the professional playing quality of a traditional slate bed pool table but with a shallower cabinet depth and protective hard covers to transform it into a gorgeous dining table within minutes. We've scoured the market to select only the best of these space-saving masterpieces for the Kingswood range - the tables we have have tried and tested in our own homes and fallen in love with. There is a style to suit everyone so browse our look books for inspiration, watch our video for the nitty gritty, or scroll down to start browsing the tables we particularly recommend. You'll find they are all beautifully designed, expertly crafted and of course professionally delivered and installed by our own team. Place a pool dining table in your kitchen diner and you can practically see the gravitational pull it exerts on children and adults of all ages. So, we had some fun and let our families and friends loose on our favourite pool dining tables that were robust enough to stand up to serious amounts of fun. If you are looking for a pool table that won't buckle under this kind of wear and tear, offers the handy versatility of a pool dining table, and a professional standard of play, this is the look book for you. We showcase the best light, modern tables that enhance contemporary, open-plan living spaces. We hope you enjoy browsing this look book as much as we enjoyed creating it. If you are tight on budget, space or just want the best of both worlds we have created a collection of pool dining tables that get the thumbs up all round for their combination of great play, style, versatility, and affordability. Get your friends over for a game and then pop on the hard covers for an instant dining table that will knock their socks off. These pool tables range in style from the very modern to warmer woods, such as light oak and beech, for a softer look that blends well with a variety of furniture. With this look book, we'll show you that with the right choice of pool dining table there's no need to compromise on fun or practicality. For when only the best is good enough, we have a collection of luxury pool tables within our select range that combine the finest materials, the latest technology, and the very best designs. These pool dining tables are often handmade to order and may take longer to get to you but will reward the extra wait with a superior level of play and aesthetics that will delight the eye every day. Because many of our luxury tables can be finished to your exact specification, we like to take you through the decision-making process personally rather than ask you to buy online. This ensures you have the many and various options laid clearly before you so that you can make an informed purchase and enables us to deliver the exact look you are seeking. So if you think your next pool table stands apart from the ordinary, browse our Luxury Pool Tables Guide and then contact us for further help and guidance. We only stock those pool dining tables that we feel offer the perfect balance of play and design - the tables we want in our own homes - so whatever your budget take a look at a few from our range that we particularly recommend. The Avant Garde delivers a professional slate bed pool dining table at an affordable price, with its contemporary legs and simple cabinet finish it also looks stunning in the home. The Kingswood Oak is made to our own design using a real oak finish. The warm wood tones are set off beautifully by the Hainsworth Smart cloth in Cadet Blue, included in the price. The Kingswood Aspen is also made to our own design. Fantastic game play is combined with this beautiful high gloss finish. Suppied with Hainsworth Smart cloth as standard, in Banker Grey she's a steal at this price. We don’t just sell pool tables - we eat, sleep and breath them. So we maintain the skills in house to create your perfect pool dining table and install it professionally. 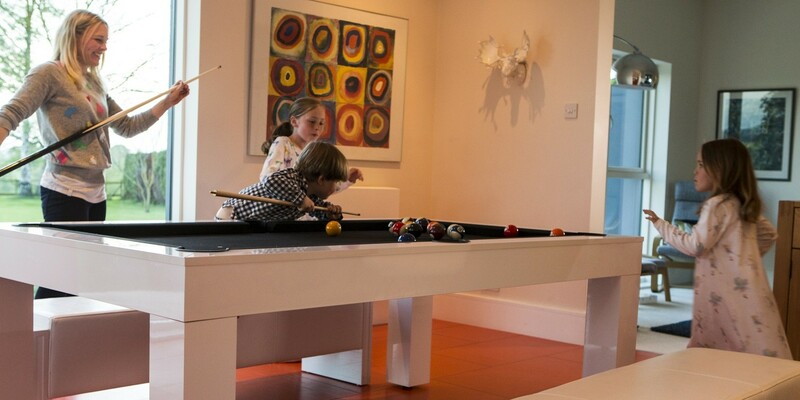 We offer an extensive range of customisation options for the pool and snooker tables we supply. There is very little our team can’t do to create the table of your dreams. We regularly create one-off pool and snooker tables to a client design or specification. So if your home requires something a little bit different we can help. For a great game, your table needs to be set up perfectly so we include delivery and installation in the price of all our tables. The price you see on our website is for a table ready to play in your home.